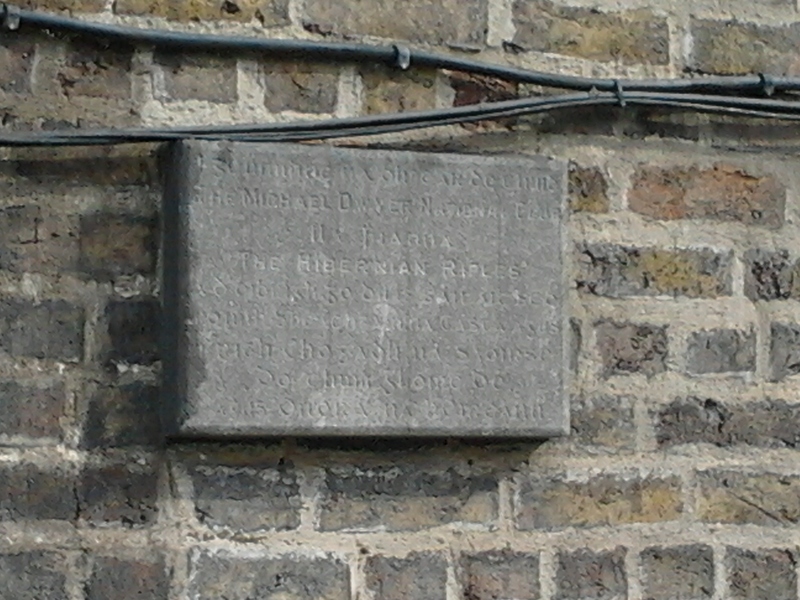 A granite plaque on the wall of the Fransiscan’s Foreign Mission Office in Dublin marking the site of a hall where The Hibernian Rifles, Na Fianna Éireann and other republican groups used to hold meetings. Occasionally when reading about the Irish revolution 1913-1923 you come across fleeting references to Republican organisations who don’t usually register on the historical radar. These groups include the Clan Na Gael Girl Scouts, Clann Maeve, St. Patrick’s Ambulance Association, the Irish National Guard and the Hibernian Rifles. Usually these groups are born of splits with more prominent organisations, have a limited membership and last only a few years. If these groups had distinct political aims and philosophies by studying them we may be able to gain a better idea of the character of republicanism during the Irish revolution. The history of the Irish Citizen Army has underlined the socialist and more radical republican element of the 1916 rising without which some historians might have tried to portray the rising as purely nationalist; an Irish struggle against England which would be a gross oversimplification. The more recent focus by historians on Cumann Na mBann and women in the Irish Citizen Army has highlighted the role of women and Irish suffragettes in the republican struggle. The Hibernian Rifles have never received more than a few lines in any book dealing with the 1916 Rising and I hope that this brief study will give us some fresh perspectives. The Ancient Order of Hibernians (A.O.H.) is a Roman Catholic political association founded by Irish immigrants in New York in 1836. It claims to be descended from earlier secret societies in Ireland namely ‘The Defenders’ and ‘The Ribbonmen’ and to have existed as early as 1641 but there is little or no evidence to support this claim. The chief aims of the association are to work for the independence of Ireland and to promote and preserve the Catholic faith. The A.O.H. is a sectarian, conservative, Catholic and nationalist body. The A.O.H enjoyed a good deal of support as a political force in Ireland and Irish communities in America during the nineteenth century. But divisions of a political nature emerged in the A.O.H., in the early 1900’s and the body split into the ‘Board of Éireann’ (B.O.E.) and the ‘Irish American Alliance’ (I.A.A.) in 1907. Officially the split was the result of a dispute on whether to register as a ‘Friendly Society’ but this was for PR purposes and masked the political nature of the split. The I.A.A was most successful in America where it had strong links with Clann Na Gael which would suggest that it was under the control, or at least under the influence of, the Irish Republican Brotherhood. The Hibernian Rifles were started as a military auxiliary to the I.A.A between 1912 and 1913 when John Joseph Scollan moved from Derry to Dublin after being appointed national director of the I.A.A. At this time the I.A.A. had three ‘divisions’ (title for local branches of Hibernians, despite the name they were civilian not military in nature) in Dublin, “The Red Hand” division in Brunswick St., “Clann Na Gael” division in Parliament St. and “O’Connell” division in Rathfarnham. A number of divisions also existed in provincial towns. Scollan noticed that the constitution of the Hibernians in the United States made provision for a military Hibernian organisation. “I decided to organise a company in each division to be known as the Hibernian Rifles which correspond to the American organisation. I started a unit in each division and succeeded in getting about twenty men to join in each. These were all highly selected men. At this time the total number of members of the divisions were 80, 100 and 150, approximately so that a unit of 20 men was a good beginning. “The first recruiting advert for the force appeared in the militant labour newspaper “The Worker” on the 22nd of November 1913. It stated that membership was open to “all Catholic Irishmen of good character” This was in line with membership criteria for the I.A.A at the time. However this requirement was dropped in all subsequent recruiting adverts in “The Worker” and “The Hibernian” newspapers. J.J. Scollan claims that the Hibernian Rifles were a non-sectarian body that its constitution “did not bar anyone from joining. It was a semi-public organisation open to all religions of all natures”. The national board of the I.A.A. were supposed to be in command of the Hibernian Rifles but Scollan was in effect the commander in chief, directing and controlling the force. Statements from former members of the Hibernian Rifles and reports in “The Hibernian” newspaper give the rank system as riflemen, captain, vice commandant and commandant. Each company selected its own officers and non-commissioned officers based on the American organisations system. J.J. Scollan held the rank of Commandant and was the driving force and Commander in Chief of the organisation. John J. Walsh had been a prominent member of the Irish Volunteers and the G.A.A. in Cork, because of his Volunteer activities he was transferred to Bradford and eventually dismissed from his civil service job. In May of 1915 he had been barred from residing in Cork he then moved to Dublin and joined the Hibernian Rifles and was promoted from rifleman to Vice Commandant in the movement because of his experience in the Irish Volunteers. Recruitment was largely from the I.A.A. divisions but the first adverts began to appear in the militant labour newspaper “The Irish Worker” from the 22nd of November 1913 onwards. Adverts were also placed in the I.A.A. newspaper “The Hibernian” which was published from June 1915 until March/April 1916 and was edited by Scollan. It had a steady national circulation of about 2,500 copes between November 1913 and April 1916. “The Hibernian” serialised the “Roll of Honour” listing those who had been killed, wounded, imprisoned , deported or served with exclusion orders for republican activity. The paper also carried adverts and notices for the Irish Volunteers. The R.I.C. and D.M.P. maintained a close watch on the rebel group and kept police intelligence files on Scollan., Millroy, Keeting and other members of the force. They were concerned with the circulation of Scollans “sedatious” newspaper and in 1919 The D.M.P. applied to the attorney general to have “The Hibernian” suppressed because it was not registered in accordance with Newspapers Libel and Registration act of 1881. With the rise of Edward Carson’s unionist “Ulster Volunteer Force” Scollan dectected “a feeling abroad that something of a counteraction should take place and this resulted in recruiting for our units becoming much easier.” By late 1913 the Hibernian Rifles had established units in Armagh, Belfast, Castlebar, Cork, Dingle and Dundalk. None of these local branched of the Hibernian Rifles ever had a membership greater than thirty or thirty five. During the 1913 lockout the fledgling Hibernian Rifles sided with the workers on strike because the majority of their membership were workers connected to the I.T.G.W.U. Their rivals in Hibernianism the B.O.E. and the Roman Catholic bishops both actively condemned the strike and supported the employers. J.J Scollan as head of the Hibernian Rifles applied to the branches of the A.O.H. (I.A.A.) in the United States for funds to support the strikers and received over one thousand dollars in support. This money was used to augment the strikers pay and members of the Hibernian Rifles received a strike pay of twelve to fifteen shillings per week. A number of rifleman who were involved in the strike later left the Hibernian Rifles to join the Irish Citizens’ Army which had been formed during the strike as the army of militant labour. When the Irish Volunteers were established in 1913 the Hibernian Rifles were hostile to the new group because some members of the Volunteer executive had taken a prominent anti-union stance during the lockout. The bitterness still surrounding the lockout and Redmondite / B.O.E involvement in the Irish Volunteers ensured that Scollan and the Hibernian Rifles maintained much stronger ties with James Connolly and the Irish Citizen Army until the Irish Volunteers split in 1914. In addition, the Hibernian Rifles in Dublin, held about twelve shotguns and thirty Italian rifles. The Skippers Alley unit of the Hibernian Rifles had taken a number of Italian rifles from Redmond’s Irish National Volunteers but these were of an old design and without ammunition so they were only used for arms drill. The Hibernian Rifles purchased whatever firearms they could as well as manufacturing their own modified shotgun cartridges using three lead tags from post bags as shot, and converting blank ammunition purchased from British soldiers into live rounds to suit the Lee Enfield rifles. While most Irish Volunteer units were still training with Hurleys (or “Tipperary Rifles” as they were dubbed) the Skippers Alley Unit of the Hibernian Rifles were quite fortunate to drill and train with real Italian rifles even if the ammunition was not available! The Hibernian Rifles also manufactured some canister grenades but otherwise hand no explosives. British surveillance of the Hibernian Rifles estimated that they had about 140 men and 25 rifles. By 1914 the I.A.A. had acquired a hall at number 28 North Fredrick Street which became the headquarters and main drill hall of the Hibernian Rifles. The hall was also used by the Keating branch of the Gaelic League and the north inner city sluagh of Fianna Éireann used by Sean Heuston. The Clann Na Gael Girl Scouts founded in 1911 by sisters May and Elizabeth Kelly also used the hall for training and May Kelly the O/C of this group was attached to the Hibernian Rifles unit during Easter Week. The hall was increasingly used as overnight accommodation by Irishmen returning to Britain to escape military conscription and by Irish Volunteer’s visiting Dublin before 1916 rising. The Irish Volunteer split in 1914 after John Redmond’s Woodenbridge speech ensured that the Irish Volunteers were now largely free from the influence of the anti-trade union body and the B.O.E. Hibernians who remained loyal to the Home Rule party and followed them into the Irish National Volunteers. The split did not affect the Hibernian Rifles and Citizen Army who developed a new attitude toward the I.R.B. dominated more radical Irish Volunteers as all three groups were united in their opposition to British recruitment and conscription in Ireland. Members of the Hibernian Rifles were actively involved in anti-recruiting activity, attending parades and public meetings organised by Connolly, the I.R.B, and the Irish Volunteers. Sean Millroy was arrested in June 1915, along with Francis Sheehy Skeffington and Séan Mac Diarmaida, for making an anti-recruitment speeches and was sentenced to three months imprisonment with hard labour. J.J. Scolan as Commandant of Hibernian Rifles was involved in financing much more direct anti-war activities. Connolly informed Scollan that the British military were building “Q” ships in the shipyards of Belfast, and that he needed to get this information to the German ambassador in the United States. “Q” ships were small civilian ships usually less than 400 tons, which were made to look run down, painted in the colours of neutral countries, and given false names. These ships were then equipped with concealed naval weaponry including four inch guns, twelve pounder artillery guns and later depth charges. “Q” ships would fly the flag of a neutral country when a U boat approached and open fire. Connolly proposed sending his daughter Nora to deliver the information in person but did not have the funds to pay her passage. Scollan agreed to pay the fare with I.A.A. funds but said he would need to show something in exchange for the money. Scollan paid the thirty pounds fare for Nora in exchange for thirty Italian service rifles. Connolly held a number of these rifles for training the Irish Citizen Army, but they were of little practical use for fighting because no ammunition was available for them. Nora Connolly delivered the message and as a result the “Q” ships were not as great a success in combating submarine warfare as the British had hoped. Scollan had some connections with the early Sinn Féin party, and gave a lecture to the Michael Dwyer Cumann on December 16th 1914 entitled “Treason in Ireland”. The content of the lecture seems to have been quite radical “Many more of us through God’s grace shall live to see the Union Jack of England down in the dust and our own immortal green interwoven with orange and white of the Irish republic waving proudly and victoriously over the land”. With the exception of Thomas Mac Donough the I.R.B. element that controlled the Irish Volunteers did not trust the Hibernian Rifles. Mac Donough had made advances to Scollan suggesting that the Hibernian Rifles should be amalgamated with the Irish Volunteers. 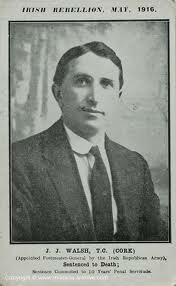 Mac Donough had also urged the Hibernian Rifles to participate in the O’Donovan Rossa funeral. Divisions of the Hibernian Rifles from around the country assembled in Dublin August 1915 for the funeral and paraded one hundred and fifty strong carrying fifty rifles. They led the I.A.A. divisions and the ladies auxiliary divisions who dipped the American flag at the funeral. The Hibernian section of the funeral was placed under the command of the O Rahially, an executive member of the Irish Volunteers. The I.R.B. element that controlled the Irish Volunteers did not trust the Hibernian Rifles and did not tell them of the planned Rising, but they learned of it from James Connolly. In autumn 1915 Scollan and J.J. Walsh held talks with Eoin McNeill, The O’Rahilly and Desmond Fitzgerald at McNeill’s house in Herbert park to try and arrange a working relationship between the Hibernian Rifles and Irish Volunteers. While cooperation with Irish Volunteers and the Irish Citizen Army increased as 1916 approached, the Hibernian Rifles remained a separate and independent group. Scollan learned of plans for a rising from Connolly “Connolly and I were in close association and through him I understood that it was intended to have an insurrection, but I had no idea of when it would take place. “It is not clear whether Connolly was alluding to his own plans for a rising of the Irish Citizen Army which he had threatening since the outbreak of the great war, or whether he imparted the information to Scollan after he had been co-opted into the I.R.B. military council and told of their plans for a rising. On Palm Sunday, with days before the rising, there was a mobilisation of volunteers at Fr. Mathew Park in Fairview after an alarm went out the British military were about to forcefully disarm the Irish Volunteers. Previous British raids had suppressed republican papers and printing presses such as “The Gael” and had attempted to shut down Connolly’s newspaper the Workers Republic. After hearing of the alert twenty members of the Hibernian rifles assembled to aid the Volunteers, at 28 North Frederick Street and proceed in twos and threes to Phibsborough where a number of Irish Volunteer companies were assembled. The raid proved to be a false alarm and the mobilisation was dismissed. On Easter Sunday the Hibernian Rifles held their usual Sunday parade in North Frederick Street and carried out their routine training. They had received no mobilisation orders from either Connolly or the I.R.B. military council. If Scollan had not received any definite orders from either Connolly or Mac Donough it is unlikely that any of the provincial units of the Hibernian Rifles had received mobilisation orders either. On Easter Sunday 1916, the Hibernian Rifles held their usual Sunday parade in North Frederick Street and carried out their routine training but when they saw that insurrection had broken out the following day, they volunteered their services. After reading McNeills countermanding order for the Irish Volunteers Scollan suspected that something serious was afoot and ordered the Dublin units of the Hibernian rifles to parade again at midday the following day. That evening Patrick Pearse, his brother William and Thomas Mac Donough met in Number 28 North Frederick Street and sent courier’s with new mobilisation orders to Volunteer companies, however the Hibernian Rifles had still not been informed of the planned rising. At midday on Easter Monday Scollan and about sixty members of the Hibernian Rifles paraded at the hall in North Frederick street. When the information came to Scollan that the volunteers had seized the G.P.O. his men got very anxious about what to do. “I addressed them and told them that as far as I knew this fight which was just starting was unofficial, but as it had started we should join in and take our place in it. At the same time I said that if any man did not wish to volunteer for the fight he was at liberty to go home”. Between twenty and thirty riflemen voted to join the fight, all were armed. Scollan sent a written message to Connolly in the G.P.O. that he was ready with the assistance and was awaiting orders. Connolly sent a reply saying he was glad of the assistance and that the Hibernian Rifles should remain in position and await further orders. Scollans men began commandeering food and supplies from local shops. Scollan went to J.J. Walsh’s tobacco and newsagents shop in Blessington Street to seek the assistance of his Vice Commandant. He found Walsh proceeded to Walsh’s sisters house off Clonliffe Road where Walsh kept his rifle and Irish Volunteer uniform. The pair then returned to North Frederick Street. At 4.pm Scollan sent a second message to Connolly stating that he was still awaiting orders that his men were getting restless for something to do. Scollan suggested that the Hibernian Rifles could occupy Leavy’s Pub on the junction of Upper Dorset Street and Blessington Street. Connolly again stated they should remain in position and await orders. At midday Connolly sent orders to the Hibernian Rifles to proceed to the G.P.O. The Hibernian Rifles were put under the temporary command of The O’Rahilly who ordered the group to break and barricade all the windows on the upper floors. Walsh was stationed at the telegraph desk on the second floor. He had a good knowledge of Morse Code and was able to pose as a government superintendent and sent out queries about the rising in an effort to obtain information. He was only able to receive a few sketchy pieces of information which he reported to Plunket and Pearse. Connolly detailed Scollan to check reports of British troops in the area while other members of the Hibernian Rifles began constructing barricades in the streets. On Easter Monday evening in the G.P.O. Pearse commissioned Jack Stanley proprietor of the Gaelic press to issue and official bulletin. Stanley seized O’Keefe’s Printworks Halston Street and printed “Irish War News” a four page news sheet, printed Tuesday morning which had “STOP PRESS!” on the back page announcing the establishment of the Irish Republic. Although the famous 1916 Proclamation of the Irish Republic does not name the Hibernian Rifles as participants in the rising Irish War News lists them as part of the “Dublin Division of the Army of the Republic”. Between 6 a.m. and 7 a.m. on Tuesday morning a contingent of Nine Volunteers from Maynooth who had slept the night in Glasnevin cemetery, arrived at the G.P.O.. Scollan and eighteen riflemen accompanied them downstairs to the armourer’s department where they were issued with home-made tin can grenades by Jim O’Neill a member of the Irish Citizen Army. Connolly addressed the mixed party and instructed them to go towards the Haypenny Bridge where the toll collector, indifferent to the revolution erupting around him, was still on duty and demanded the halfpenny toll for each man. Needless to say he did not get it. 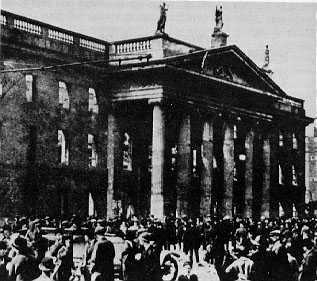 Volunteers now occupied the roof of the Exchange Hotel and began barricading houses immediately adjacent to it. The area around City Hall appeared to be under British military control and the Hibernian Rifles and Volunteers engaged superior numbers of British forces in rooftop sniping. That afternoon groups of the Irish Fusiliers and Enniskilling Fusiliers advanced and prepared to storm the Exchange Hotel. The attack was repelled with rifle and shotgun fire. From the roof Scollan estimated they had inflicted over twenty serious casualties on the British military forces. During the attack Edward Walsh a member of the Hibernian Rifles sniping from the roofs was shot through the stomach. About 4.30 p.m Scollan’s group was coming under increasing pressure received orders to retire to the G.P.O. and were helped by a number of sympathetic citizens to make their journey. They took the wounded Edward Walsh with them and he died that evening in the G.P.O. leaving a widow and two children. At this point number of the Hibernian Rifles were separated from the main body during the retreat and wandered into British military forces around Dame Street where they were taken prisoner. On Thursday morning Connolly instructed Scollan to make his way to Broadstone station to report on conditions there. Scollan was challenged by a British sentry at the station and questioned by a British officer inside. Scollan claimed he was a stranger in Dublin, and was at the station to try and find his way about. He was taken prisoner and transferred to Ship Street Barracks the following day. He was kept in custody and fed on British military rations of bully beef and hard biscuit until the rising had ended. The remaining members of the Hibernian Rifles surrendered with the G.P.O. garrison at Parnell Street on the 29th of April on Friday May 6th Scollan was transferred to Richmond barracks before being transported to England by cattle boat and interned in Wandsworth prison. In July 1916 Scollan was transferred to Frongoch Internment camp in Wales where at least seven other Riflemen who had fought in the rising were interned. Scollan was appointed camp treasurer until he was transferred to Reading jail on October 30. Michael Collins was then elected to fill his position. Scollan and Hibernian Riflemen interned in Frongoch were released under the general amnesty at Christmas 1916. J.J. Walsh was less fortunate, being singled out for courtmartial and sentenced to ten years penal servitude because of his previous role in the Irish Volunteers. Walsh was released with the remaining republican prisoners on June 15th 1917. The more conservative and sectarian Board or Erin Hibernianism largely disappeared in Ireland with the failure of the Home Rule Party in 1918. They could not adapt their religious or political beliefs to the non-sectarian Republican ideals of the 1916 Proclomation and the rising which soon grabbed the attention of a majority of the people in Ireland. Republicans had begun to openly attack the Board of Erin Hibernian halls and their meetings by 1920 because of their continued support for the John Redmond’s House Rule Party. The more conservative and sectarian Board or Erin Hibernianism largely disappeared in Ireland with the failure of the Home Rule Party in 1918. Little is known of the Hibernain Rifles group after 1916. A number of members of the Ancient Order of Hibernians were executed by the IRA on suspicion of being British Spies and the IRA in Belfast found themselves in conflict with armed Hibernians. Today the Ancient Order of Hibernians have almost completely died out in the 26 counties of southern Ireland and have a very small presence in some areas of the 6 counties in the north of Ireland where they still hold marches on Roman Catholic feast days. Little information is available on Hibernian Rifles after the general release of prisoners after December 1916. While groups such as the Irish Citizen Army retained a large degree of independence from the Irish Volunteers after the Irish Republican Army had been formed in the rebellion, the Hibernian Rifles disappeared completely as a separate military group and became part of the First Battalion Dublin Brigade of the I.R.A. with its re-organisation in 1917. Number 28 North Frederick Street remained a hotbed of rebel activity between 1917 and 1918 and R.I.C. raids were made on the hall only to be resisted by former members of the Hibernian Rifles now serving as I.R.A. Volunteers. Most of the Hibernian Rifles veterans remained active until the Civil war. One example is Francis Devine who continued military activities with E Coy. 1st Batt. Of the Dublin Brigade I.R.A. After his release from prison he served as a company quartermaster and assisted in the reorganising and training of I.R.A. companies. He was interned for three months under the defence of the realm act for his republican activities and later assisted Harry Boland in canvassing for Sinn Féin in Armagh during the 1918 elections. Devine was on continuous active service from 1919 until truce in July 1921 supplying arms for ambushes and commanding armed patrols. He opted to take a neutral position during the Civil War. After his release and return to Dublin at Christmas 1916 J.J. Scollan noted “There was a decided change in the outlook of the people. Whereas they were hostile to us when we were being deported, they were now friendly and sympathetic.” “The Hibernian” newspaper was not re-established by Scollan after his release in 1916 and the Irish Branches of the Irish American Alliance were amalgamated into the Sinn Féin political party that developed in 1917. Sinn Féin annexation of the I.A.A. ended political journey, toward republicanism away from sectarian nationalism, that the Irish American Allicance and the Hibernian Rifles has been making since their split with the Board of Érin – Ancient Order of Hibernians in 1907. Padraig Og O Ruairc is a PhD student at the University of Limerick. He has published a number of books and articles on the War of Independence & Civil War in Clare and Limerick. His most recent book “Revolution – A Photograph History of Revolutionary Ireland 1913 -1923” was short listed for the Best Irish Published Book category in the 2011 Irish Book Awards. Police Reports, Dublin Castle NAUK CO 904. “The Irish Times Sinn Féin Rebellion Handbook”. “Frongoch – University of Revolution” by Sean O Mahony. “Agony at Easter” by T.M. Coffey. “The Men Will Talk To Me, Galway interviews by Ernie O Malley” Edited by Cormac Ó Comhraí. Written by: PadraigOgORuairc on 31 March, 2013. Last revised by: John_Dorney6 November, 2013. 50 Responses to "A Short History of the Hibernian Rifles 1912-1916"
I have long argued that one should refer to “physical force nationalists” rather than “constitutional nationalists”. The latter is somewhat inaccurate (at least up to the late 1920s or ’30s). Every Irish political leader, from O’Connell to Redmond, had his own “mountain-side men” to call upon. The Free State side during the civil war was the ultimate expression of physical force nationalism. There are in fact many republicans who are active in the AOH today. There is a strong AOH organisation in Derry, Tyrone and Armagh. Some would be Sinn Fein supporters, others like Gery McGeough critics of that party. The AOH in the north, referrred to by Jim McDermott and Robert Lynch, were of the Board of Erin variety – Belfast Nationalist MP Joe Devlin was their Grand Master at one point. Padraig’s article makes it clear the Hibernian Rifles came from the other side of the AOH split. However in November 1921 during the pogrom, the Devlinite AOH were rumoured to be in the process of setting up an armed wing of their own, to be known as the Hibernian Knights – again, totally distinct from the Hibernian Rifles. Board of Erin is the governing body of the AOH in Ireland. There are now fraternal relations with the AOH in the USA. Just today the AOH in Derry organised a conference addressed by Martina Anderson of Sinn Fein, as well as speakers from the SDLP’ and unionists. The AOH is far from moribund and is actually growing in Cavan and Donegal, as well as in the six counties. Excellent article. Does anyone know if Patrick Moylett of Ballyhaunis, who was briefly President of the Supreme Council of the IRB in 1919/1920 or so, had a connection with the Hibernian Rifles? Hello All – I’m glad the article is generating some interest. Regarding the current state of the AOH in Ireland Sean makes the point that the AOH (Board of Erin) still have branches in Derry, Tyrone, Armagh, Cavan and Donegal and states that the organisation “is far from moribund and is actually growing” in some of these counties. Well the Orange Order still have lodges in Monaghan, Wicklow, Dublin and Donegal, where they still hold events and parades and recruit new members – but you could hardly say that they were not moribund. The reality is that the AOH like the Irish National Foresters only have a small presence in the north and in southern border counties. They do not have any branches outside of Ulster and remain a minority interest group with no role in Irish political life especially in the south where society has become increasingly secular over the last few decades. I think my comment that “Today the Ancient Order of Hibernians have almost completely died out in the 26 counties of southern Ireland and have a very small presence in some areas of the 6 counties in the north of Ireland…” is a fair summary of the situation. As to the claim that there are many ‘republicans’ active in the AOH today – I would argue that anyone who is a genuine republican could not belong to the AOH. Woulfe Tone the Protestant founding father of Irish Republicanism stated that his aim was to unite Catholic, Protestant and Dissenter. similarly the 1916 Proclamation guaranteed “equal civil and religious liberties to all its citizens” ignoring past cultural and religious differences. In my understanding no one who follows the republican political philosophies as outlined by Tone, Emmett, Connolly and McSweeny could belong to an organisation that discriminated on the basis of religion. I am open to correction on this but I seem to recall a radio interview with the head of the AOH in Ireland about 2003 /2004 during which he declared that the body was a “Nationalist” organisation and specifically stated that it was not a Republican one. – An assessment I would agree with. Obviously there are differences between the Orange Orger and the AOH in terms of their cultural identity and whether their members see themselves as British or Irish, but putting that aside is there any real difference between the practices of the two? Aren’t they just two opposing Orange and Green sides of the same antiquated sectarian coin? Dan, Regarding Patrick Moylett and the Hibernian Rifles. I’ve done some research on him and don’t recall him mentioning it, but you should check out his BMH Witness Statement which is available for free online and see if he mentions it there. Perhaps Padraic wants to tell Gerry McGeough he is not a republican! I am aware of history. But while AOH membership is cross party, there are republicans in their ranks. Some of the heroes of 98 feature on AOH banners. Sinn Fein attend AOH events, like the recent conference in Derry. I would say that Gerry McGeough is a right-wing, conservative, Catholic-Nationalist whose nationalism is chauvinistically ethno-centric. Are any of the Protestant and Presbyterian heroes of 1798 featured on AOH banners? I’d suspect not – even though the United Irishmen’s leadership were largely Protestant especially in the districts where the AOH still exists. James Connolly, Terrance McSweeny and many other republican leaders stated that Republicanism and Hibernianism are not compatible and I think they had it right. It’s very telling that during the War of Independence the B.O.E. Hibernians were very anti-Republican, attacking Sinn Féin supporters and members of the IRA. In some areas, like Armagh, Hibernians even gave assistance to the British forces and were executed by the IRA on suspicion of being informers. I attended a commemoration around 6 or 7 years ago at which Gerry McGeough was the main speaker on the day. I can’t say I had heard of him before then, but he made a point of telling the audience that he was NOT a republican, but a nationalist. He followed that up by launching into a sectarian tirade about how Protestants couldn’t be Irish! Even Wolfe Tone came in for McGeough’s ire. It was disgusting stuff. I looked into him when I saw all this and was told by some disapproving AOH-types that McGeough and some of his buddies had been trying to pull off a entryist style takeover of the AOH, but failed. His “faction” did manage to make the news around then by throwing a few copies of the constitution at Michael McDowell. And I would add that not only did Gerry McGeough attack Protestantism, he also attacked the Pope and the Roman Catholic Church which he claimed was the stooge of the Soviets having been infiltrated by the Communist Cardinals. It was a pretty weird day all in all. More Catholic than the Pope eh? Hello Des, Thanks for the compliments on the article but I’m afraid I don’t have any additional information about Moylett or the incident described. Des, a likely candidate is what used to be (until the 1980s) the Academy Cinema on present-day Pearse St. It’s approx 100m from the railway bridge that leads from Westland Row to Tara St stations, and at the time of the War of Independence it was known as the Ancient Concert Rooms. I know there was a definite connection between it and the Volunteers, so possibly also with the Hibernian Rifles, but I can’t for the life of me remember where I read about it. Pearse St Garda station at the far end on the same side of the street is what was then Great Brunswick St DMP station, in fact there’s still a carving of a DMP officer on the facade (scroll down here http://comeheretome.com/2011/10/26/plaques-of-dublin-dublin-metropolitan-police-temple-bar/ for a photo). Of interest to the discussants might be a book called ‘Displaying Faith’ by Neil Jarman, published in 1999. It has a lot of photographs of Orange, Hibernian and other banners. The AOH banners contain, among others, images of St. Patrick, the Virgin Mary, Rory og O More, Owen Roe O’Neill, Patrick Sarsfield, mass rocks and Penal days persecution, Daniel O’Connell, Joe Devlin, T.P. O’Connor, John Redmond and John Dillon. There are also banners commemorating members of the AOH who were killed in the modern conflict. But there are some AOH banners that feature the Battle of Antrim, Robert Emmet and surprisingly James Connolly, Padraig Pearse and Tom Clarke. The Irish National Foresters have more strongly republican images, including Henry Joy McCracken, John Mitchel and Roger Casement. (I believe the INF are non-sectarian). The AOH in Cavan and Donegal were linked to Fine Gael at various stages. Fergal McCluskey’s book on Tyrone, ‘Fenians and Ribbonmen’ is very good on the republican/Hibernian rivalry in the early 1900s. Many thanks – I’ll go with that. The Antient Concert Rooms has the added association of being where Mrs Kearney wreaks havoc on the Eire Ebu Society’s proposed series of four grand concerts in the story ‘A Mother’ from James Joyce’s Dubliners. I’ll have to check them out. I think a national study of Hibernianism during the period of the 1916 Rising and War of Independence is long overdue. It would be interesting to learn more about their links with the Irish Parliamentary Party & Fine Gael. We know the AOH (BOE) used violence to try and subdue the I.P.P.’s political opponents in the early 1900’s and were engaged in street battles against Republicans between 1917 and 1922. (A point the AOH’s official website seems to gloss over saying: “They [the AOH] remained true to their principles, and gave neither support nor opposition to the militants during the 1916 insurrection, the War of Independence, and the Civil War that followed.” http://www.aoh.com/aoh-history/) I wonder, in later years, when the AOH were associated with Fine Gael following the collapse of the I.P.P. what relationship, if any, they had with the Blueshirts? Banquet in honour of James F Dalton at the Aberdeen Hall, Gresham hotel, ‘remarkable for the number who attended and for the enthusiasm of the proceedings’. Mr Dalton is presented with an illuminated address in a handsome and massive frame. “An historic national demonstration which marked itself indelibly in the annals of the country’s doings” – The Freeman’s Journal’s description of a mass Home Rule demonstration. Aong the speakers, Mr PH Pearse BL, speaking from that platform (of four) located by the GPO, said “” The Bill which we support today will be for the good of Ireland and … we shall be stronger with it than without it” and concluded his speech “Tuigeadh Gaill má fealltar orainn ar’s go mbeidh ina chogadh craorag ar fud na hÉireann.” (“Let the English understand if we are betrayed again there will be red war throughout Ireland”). A good question, though Eoin O’Duffy hated them and ordered the killing of a couple of their members in Monaghan in 1920-21- something neither side forgot. Do you think there this a clear blue sea between those views and those of many Tyrone republicans? Many of McGeough’s comrades would blush at the far-right stuff but agree fundamentally that they were fighting ‘planters’. One of the interesting arguments in Fergal McGarry’s 1916 book is how the views of the rank and file rebels were much closer to the ‘for god and Ireland’ ideas than those of their leaders. The 1916 IRB bore little relation to the 1867 version (whose manifesto is fair more radical). Sean MacDiarmaida was an ex-Hibernian, who thought the idea of solidarity between Irish and British workers in the Lockout was ridiculous and who objected to including ‘Irishwomen’ in the Proclamation. We shouldn’t be surprised the Free State was conservative. The Hibs just changed sides. Whatever about the ideas of Tyrone republicans since the 1970s, Sean McDermott may once have been a Hibernian, but was ‘converted’ to republicanism by Ulster Quaker Bulmer Hobson in Belfast in about 1905 and thereafter despised the Hibs (as a good IRB man of that era would). The newspaper he managed ‘Irish Freedom’ (1910-14) would bang on relentlessly abut how ‘Hibernianism is just Orangeism in reverse’, ‘just a job cornering organisation’ and ‘sectarianism is the death of the national ideal’, etc. It’s true he wasn’t keen on British unions helping the Dublin strikers in the lockout, though he supported the strikers themselves. I didn’t know about him objecting to women in the proclamation, interesting though, what is the source? But anyway, while he may have been zealously anti-English he was not a sectarian thinker. In the IRB of 1916, the truth is there were radicals and conservatives and some radicals who later became very conservative – a good example being Ulsterman Ernest Blythe. I’ll grant you that the 1867 proclamation is much more radical in rhetoric than the 1916 one – calling for ‘separation of Church and state’, ‘absolute liberty of expression’ and calling for support from the English people. But to be honest I think the rank and file of 1867 and 1916-23 were not that different in their views. I’m doing some research on Scollan. He was born in England to Fermanagh parents and in 1901 was living with his widowed mother in Water Street, Enniskillen, where he was a compositor on the Impartial Reporter newspaper. He died in Dublin 1962 and De Valera attended his funeral. He was my grandfather. I was born in 1963 and never met him. Though I have his service medals and paperwork. Do you have details of your grandfathers family history. I’m researching Scollan/Scollen history and believe there may be a connection from the early 1800’s in Clogher. Very little. Other than where he lived, his wife and my father’s family. I’d love to hear what you have. I’m related to Constantine Scollen (Missionary priest to Canada) who was from Galloon Island, Fermanagh. Don’t want to upset anyone by putting posts that should not be on this site. Is there a way to message off this site? Hello there JESCOLLAN – are you aware that there is an historical society in Fermanagh who would be very interested to talk to you about your grandfather as they are currently putting together a history of Fermanagh volunteers in the rising? Wow! I had no idea. Can you give me contact information for them? First off, Maith thu Padraig! Excellent, well detailed article, it finally does justice to the Hib rifles and volunteers like Scollan, despite years of being written out. For those who haven’t read them, their witness statements are well worth a read if you check out the BMH site, it would be nice if a book of sorts were put out on them for the centenary of the Lockout or Rising. But, regarding some comments a few things must be said in fairness to the AOH, coming from someone who’s both a republican and an american AOH supporter. There are many people in the US AOH who would be of the Scollan-Connolly sympathizer type. I know several who are quite active and left leaning Irish Republicans, and at least one from Belfast, Malachy McAllister, was in the INLA. (He’s currently fighting extradition from the US and the AOH has been very successful in defending him). In the US they’re also vocal supporters of immigration reform and social activity helping their communities. There’s even an official program pushing to educate people about the benefits of Irish re-unification. Now I understand the membership in Ireland is different and mostly made up of green nationalists and “Castle catholics” but bear in mind, as the US branches and Hibernian Rifles show, its a diverse organization. And the IRA itself was hardly free from sectarianism- accusations against the AOH are light in comparison to certain incidents best left for another discussion. Not to take away from a wonderful article, but not all AOH-ers can be painted the same shade of green. Many then and now have done their duty for a non-sectarian republic, within their personal identity as Irish Catholics. my grandfather was Francis Devine. He was well acquainted with your grandfather as i have documentation and forms filled in by jj scollan defending my grandfather for his military pension in 1935 and his role in the rising as he served under scollan in the GPO and in parliment street. Also my grandfather was quater master for the 1st batt e coy. He was a member of the Hib riffles from the very start, also along with your grandfather. Go raibh míle maith agat as an alt sin, a Phádraig. I have posted it on the new FB page The True History of Ireland. Are there any photos of the Hibernian Rifles with weapons? At the Battle of Annesley Bridge talk/ tour that was recently held it was stated that sniping at British troops went on in an area from Ballybough to the Docks right up to Monday 1916, DESPITE ALL ICA AND VOLUNTEERS HAVING BEEN ORDERED OUT OF THE AREA ON THE TUESDAY BEFORE (if I recall it properly). Could these have been HR men? The tour is up on Youtube in 8 stops. The AOH is a mixed bag but nationalist rather than Republican and In Derry fell out with a number of non-SF Republicans and Civil Rights veterans some years ago. But I would say that quite a few Republicans are fundamentally nationalists. And the movement was certainly unwilling for nearly a century to take on the Catholic Church, despite its often-declared hostility towards the movement, on any of the social issues around birth control, sexuality, censorship, monopoly of education and social services or of abuse. The AOH in the USA had the PSNI on their NY St. Patrick’s Day parade this year, which is a disgusting thing to have done considering not only the reputation of that body now and in the past when they were called the RUC, but also the fact that they are a British colonial force in still-occupied Ireland. Gerry McGeough, for all his right-wing conservatism did at least oppose collaboration with the PSNI which is why they took him and gave him two years on a charge from 30 years previously. And Gerry Adams, for all his Republican rhetoric (and, previously quasi-socialist rhetoric too), encouraged the AOH to go ahead and entertain the PSNI. The AOH has nothing to do with the NY St. Patrick’s Day Parade other than to be participants! Hi Rebel Breeze, that talk was on May 2013, organised by Phizzfest – the Phibsborough Community Arts Festival. Sorry I slipped up with the invite – no offence intended! Thanks for the original article, Padraig. It filled in a lot of holes in the 1916 activity. However there are a few things that must be clarified. First, the AOH in America and the AOH in Ireland split in 1894 over administrative and conceptual differences including the membership requirement that both parents had to be Irish Catholics. This allowed sons of mixed marriages to join the American Order; the granting of Honorary membership to non-Catholic supporters of the Order also became an issue as did the growing loyalty to the adopted United States which was not as deeply felt in Ireland. Further, the American Order resented being involved in Irish land issues and other political issues. Over time, the American order grew more militant as a result of the animosity felt by exiles from the Great Hunger finding greater freedom of expression. At about 1907 the Board of Erin, which had grown more reactionary Catholic as a result of Orange opposition, saw a defection of many of its members who embraced the growing militant form of nationalism resulting from the influence of the Gaelic Revival literature. These defectors re-affiliated with the American Order as the American Alliance. and supported the non-denominational Citizen Army. They also initially opposed the Volunteers because of the Redmonites therein. Although they did support them after Redmond’s group left. Further, with reference to the comment by rebelbreeze on 30 June 2014 that the AOH in America allowed the PSNI to march in their New York St. Patrick’s Parade, everyone knows (except him) that the AOH has not run that parade for the last 15 years. The St. Patrick’s Day Parade Committee Inc. has nothing to do with the AOH! If you mail me at caitrionanc@hotmail.com I’ll put you in touch with the people who are researching your grandfather. Think a lot of this Nationalist v Republican thing is over played a 100 years ago and today. It’s always going to be politically fluid. Remember it’s a small world, people do know each other. Btw, Joe Devlin and pro and anti treaty people were all trapped in the six county Orange State after the Civil War. That must have made for some interesting conversations. And every faction in the North spoke to each other, they had no choice in the matter. Btw, last time i looked it wasn’t as clear cut politically in a few places in Ireland. Co. Cork being a strange one with various shades of nationalism fighting it out on the streets 30 years before the Blue Shirts arrived. Don’t be too hard on Gerry up in Tyrone, was the commemoration that was mentioned an RSF one by any chance? The main man in this article about the Hibernian Rifles was still around to see Elvis as was Dev. I missed Mike McCormack’s dismissive reply and correction to my post, the later for which I thank him and only came across this while looking for something else. Whether “everyone knows” that the New York St. Patrick’s Day Parade has not been run by the AOH for so long I doubt very much but I was certainly under the impression, mistakenly, that they did run the Parade. But that the AOH has nothing to do with the running of it is hard to credit. They continued to form the backbone of its organisation and, as my informants in the USA tell, me still do. AOH members used their networks to lobby against gay group participation in the Parade (and, more recently, to lobby Irish contacts to vote against the right to gay marriage). Of course, not all AOH members, whether in the USA or in Ireland, are of that ilk. And it needs to be said that people do at times belong, whether from convenience or social reasons, to organisations that do not necessarily reflect their own personal beliefs — armed services and conservative clubs being cases in point. Although I detest the AOH’s sectarianism I do think it is important to recognise that Orangeism was the aggressor and Hibernianism a defence. This is wandering a good distance from the subject matter of the original post, but the rather categorical assertion “ “ lends itself to a response. Pope Pius V ‘ declaration “Regnans in Excelsis” constituted a profound attack on the concept of Freedom of Conscience, which was a fundamental principle of the Reformation. (The background to the reformation is too large a subject to go into here). But consider the Charter of Rights and Freedoms section of the Constitution of Canada which lists what the Charter calls “fundamental freedoms” theoretically applying to everyone in Canada, and enforceable by the courts. The fundamental freedoms are freedom of expression, freedom of religion, freedom of thought, freedom of belief, freedom of peaceful assembly, and freedom of association. These characteristics of Canadian legislative self-determination are very far removed from the political dispensation envisaged in Pius V’s prescription – a prescription to which he taught Roman Catholics to be bound on pain of eternal damnation. It is difficult to interpret Pius’ initiative as anything but a profoundly aggressive, act; amounting, pretty much, to a declaration of “Jihad” on populations such as the one that sought religious freedom in Northern Ireland during the turbulent decades of religious conflict in England in the sixteenth and seventeenth centuries. Regnans in Excelsis had disastrous consequences in Ireland and for Ireland and for Irish people of diverse religious faiths and cultural backgrounds. If the current Pope visits Ireland in the course of the decade of centenaries, he would do very well to acknowledge its error and status as a “false teaching” ( See letters of St Paul); formally withdraw it and apologise for the egregious, pernicious and sustained harm that it has done. Perhaps then, the way would be set for another All Ireland Referendum, this time to insert a new Articles 2 & 3 into the fundamental law, on the Canadian model, guaranteeing justiciable “fundamental freedoms” to all who live on this island, including freedom of expression, freedom of religion, freedom of thought, freedom of belief, freedom of peaceful assembly, and freedom of association. 1916 generally is an interesting study from the perspective of freedom of conscience: the 50 members of the Hibernian Rifles who participated did so in defiance the obligations they’d taken on joining the Hibernian organisation, which was non revolutionary in character. Those who were members of both the Volunteers and the IRB participated in defiance of their commitment of loyalty as Volunteers, to the Volunteer Executive, and also in defiance of the authority of the IRB Supreme Council which had been usurped by the self-selected Military Council. It was in the midst of this chaos of overlapping, layered and sometimes conflicting oaths and loyalties that the order for the Rising was conceived and promulgated. Can anyone help on information on a branch . AOH div 678 Kilcolman Co Limerick Regards Jim. Sadly, the AOH in America has little or no details on specific Divisions of the AOH Board of Erin. We share the same name, but are two distinctly separate organizations.